The Gleanndal Hostel is where mountain meets sea in the tiny village of North Glendale on the rugged eastern coast of South Uist. The Hostel is on the shore of Loch Boisdale, a sea loch, so you will have great opportunity for a bit of seal and otter spotting, this whole area is abundant in wildlife. South Uist is one of the islands that of the Western Isles (Outer Hebrides) archipelago, 70 miles off the North West of Scotland out in the Atlantic Ocean. 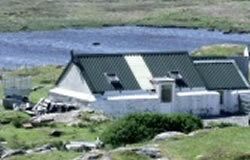 The Hostel building is a renovated Blackhouse, the traditional stone cottage of the Highlands and Islands. It has a bunkroom, self-catering kitchen area, shower and toilet. 6 bunks, some are accessed by ladder, the upper bunks are not suitable for under 7's. Please let us know when you book if you are going to need a ground level bunk. All the bunks have curtains. Overflow space for larger groups may be available in our chalet at the same price, please enquire as to availability. Mattresses, pillows, sheets and duvets provided. Toilet, wash basin and shower with adjoining changing area. Towels are available for hire on request, £1 each. Kettle, toaster, 4 ring hob, microwave cooker. The utensils and crockery that you will need to prepare a meal are provided. Outdoor washing line with clothes pegs behind the accommodation. Boots can be dried on the ledge behind the stove. Our Hostel is heated by a stove. The fuel we use is locally cut peat, few things are more cosy and evocative of the traditional Hebridean life than the smell of a turf fire. Wireless broadband is currently being installed for the Hostel. If it essential for your stay, please enquire before booking. There is a clock radio and cd player. We also provide a table which sits 6 and folding chairs.